Fennel seeds are not only used in the cooking but also consumed as the mouth freshener. It clears mouth and leaves a refreshing feeling after the meal. Every Indian restaurant will have this fennel seeds in the counter along with the tooth pics. Some restaurants serve them as raw, some serve as dry roasted, and some serve with sugar coated like M&Ms. If you prefer to have fennel seeds as mouth refresher, have around ten seeds, chew gently and slowly, allow the extract to coat the mouth. Which gives refreshing feeling and on the other hands, it helps for better digestion as well. If you have not tried it before, try it you will regret that you have not used these for all these years. My way of cooking is real food based cooking. Where I try to minimize that usage of a store-bought readymade Masala spice mix. To ditch the readymade garam masala from your kitchen, add fennel seed and the cinnamon bark for seasoning, which is an excellent substitution for the garam masala. If you try this combination once and you will never buy any ready-made spice mixes. This is Often confused with cumin seeds. Fennel seeds are bright and more prominent when comparing cumin seeds. Personally, In my childhood days, I often confused with cumin seeds as they both resemble in the shape and the texture. But these slightly vary in the color. Little knowledge and the practice makes easier to differentiate any similar ingredients. I grew up learning the characters and the distinctions of the spices and the lentils. Thought they all looks the same, but the taste and the purpose of using it are different. Identifying the spices is the entry level in any kitchen. Understing its usage and the way of using it is the basic level. Using them according to the recipe is the secondary level. Understanding the relations with other spices and combine them is the advanced level. If you are here and reading this much far, I consider you at the advanced level. 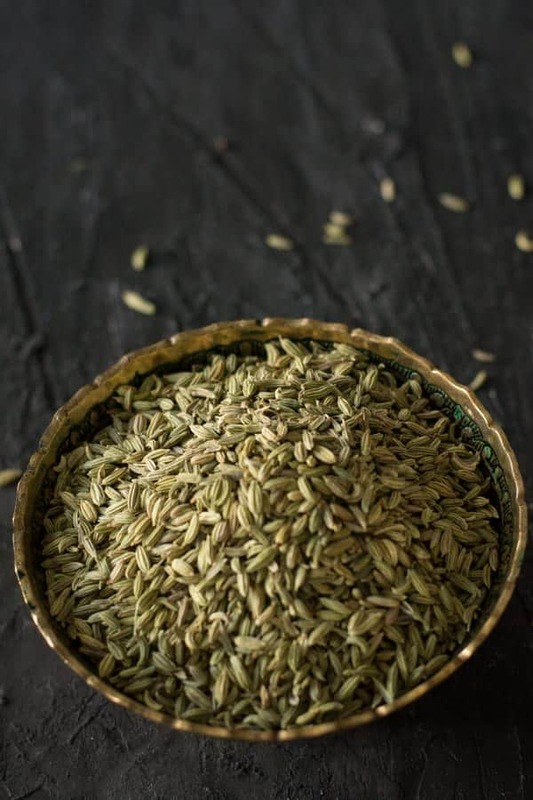 I let you know the best ways to enhance the flavors by combining this fennel seeds with other Indian spices. Fennel seeds can combine well with cumin seeds. Fennel and mustard seeds may not play together well. (and this is my opinion). Fenugreek and fennel seeds are also not a great combination. Instead, ground fennel will significantly blend with ground cumin and ground fenugreek also. How to eat fennel seeds? You can consume this seed as a whole or as the powder form. Like cumin, this fennel seed also added as a whole for the seasoning purposes and the powder form used as a flavoring agent. The north Indians used to sprinkle fennel seed powder in the final dish to boost up all the flavors of the bowl. Generally, they used to sprinkle on the chat dishes, which is similar to salsa or salad here in the United States. Fennel seeds are a great source of dietary fiber and antioxidants. And also a good source of minerals like copper, iron, calcium, potassium, selenium, zinc and magnesium. It is also a vital source of vitamins like Vitamin E and vitamin C. So what do you wait for start including fennel seeds in your menu. And it is one of the ingredients which is used in the Indian traditional medical practices for age. It is believed to improve the digestive health and improves the blood pressure, and good for the skin. Where to buy fennel seeds? I have not seen fennel seeds in my nearby grocery stores Wegmans or Walmart. But you can get it from your nearby Indian or Asian stores. Alternatively, you can also get it online. Fennel is used in Indian cooking in two forms — whole and ground form. If you’re using seeds of the whole, add it to sizzling cooking oil and fry it becomes golden brown color. Add this seasoning to the dish. How to grind fennel seeds? This may sound complex, but not at all. It is simple and can make it with a few minutes. First, add it to a pan and dry roast until its changes it color. Then grind to the fine powder using mortar and pestle or the spice grinder. These ground fennel seeds are good to use for about two months in the room temperature. These are called as Sombu in Tamil, Peda jilakara / Sopu in Telugu and Sonf in Hindi. This is called in different names in different languages in India. And these are the essential translations for this popular additive.